Bass fishing on the Upper Mississippi River around Wisconsin, Iowa, Minnesota and parts thereabouts, Tom Monsoor is the man to beat, or more accurately stated, the man you can't beat. A professional bass fisherman by trade, Tom Monsoor has originated and perfected the art of swimming jigs with devastating results. David Snyder of the Wisconsin State B.A.S.S. 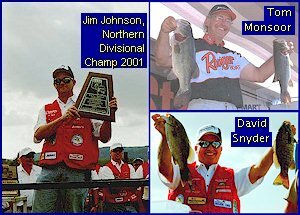 Federation says, "Many have tried to duplicate or discover the secrets of swimming jigs from Tom Monsoor, but few have learned all the pieces of the puzzle yet from Tom," says Dave Snyder. Team Yamamoto's Jimmy Johnson is one who has pursued this technique, learning some parts of it from Tom Monsoor, and also working with David Snyder to hand-pour the specialized jigs required for the swimming application. "I've had a mold machined along the lines of what I believe to be representative of some of the earlier styles of jigs used by Tom Monsoor. I can't say these are what Tom uses now, but they are similar to some swimming jigs that Tom had used along the way," says Dave Snyder. There are two sizes of swimming jigs that work for me, says Jimmy Johnson. The light model weighs just over one-eighth and the heavy model weighs between three-sixteenths and one-quarter ounce. A 2/0 is commonly molded into the light, and a 3/0 in the heavy. Not just any jig hook will do. A highly-desirable component of the swimming jig is an Owner Needle Point hook. The first step in making a swimming jig requires a special treatment to heat and hand-bend the eye of each hook to the proper angle, says Dave Snyder. There seems to be a sweet spot when the line tie eye gets to a low enough angle that ensures swimming action, but not so low of an angle that the jig veers off on its side during the steady swimming retrieve. A certain jig is required. After all the effort that goes into producing just one single jig, if the jig rolls off to the side, fish don't want anything to do with them. In the end, if the jig doesn't swim straight, I discard it, says Jimmy. Needless to say, this means the jigmaker takes great pains to ensure each jig comes out as perfect and precisely-balanced as possible. The jigs are poured without the fiber weedguard inserted yet, because it is unpredictable whether the weedguard will come out of the mold straight or warped from the heat, which will unbalance the swimming action. At a later step in the jigmaking process, Jimmy will split a standard count fiber weedguard in half and glue one half into the jig head, ensuring it is seated perfectly straight. One of the big things is that the fibers in the fiberguard are softer than usual. Jimmy doesn't usually fan or trim the fiberguard. For weeds, which is where the swimming jig is used, the fiberguard as shown in the photos will come through weeds without hook problems, plus the specially-bent hook eye also deflects weeds and doesn't seem to get hung up in weeds. Most important of all is to make sure the final product comes through the water straight and upright. The soft fiberguard and needle point hook are important. Due to the softness of the fiberguard and the presence of the Owner Needle Point hook, fish come up and grab it, swim off to the side and are already hooked - no hookset per se. Most important is I do not want line stretch once they grab the jig, says Jimmy. I don't have to set the hook at all with the 16 lb. test Sugoi line I use for swimming jigs. I use a 6'6" medium/heavy St. Croix or Loomis stick with a Shimano Chronarch. The bite can vary from something that rips the rod out of your hand to just feeling pressure as you swim the jig back, but it always seems the hook gets stuck in the roof of the mouth...the part of your mouth you always burn when you eat a steaming hot slice of pizza pie right out of a brick oven. I use the light size swimming jig around heavy weeds, says Jimmy. Where there is dense grass, throw on top of the mats and the light jig will not get hung up or bogged down on top. I use it like other anglers may use a hollow soft grass frog or mat rat, swimming the light jig across the surface of the mats and pausing it, dropping it in sparse open pockets. The heavy jig seems to embed in thick surface grass more than the light size. I retrieve the swimming jig at the same speeds you would use a spinnerbait. The main thing I like to target with the light jig is matted-out grass beds growing to the surface and laying over on top. I may use the heavy jig along the irregular edges of a weed line or swimming over the tops of weeds that are still submerged under the water. I use the swimming jig by keeping it up in the top two feet of the surface layer of water all the time. Even in water down to 15 feet deep, fish will come off the bottom to take the swimming jig up near the top. On the retrieve, I keep the rod tip about ten o'clock and simply wind line in with a steady retrieve...typically a medium speed equivalent to using a spinnerbait. As a trailer, I use a 4" or 5" Yamamoto single tail grub depending on how fast I want to swim the jig, and I always use fishing glue to attach the trailer to the hook. The curly tail always goes down when I put on the trailer. By varying the 4" or 5" single tail grub trailers with light or heavy jigs, fish will tell you which one of the four possible speed and depth variations they prefer at any particular moment. These four presentations are possible due to two jig head sizes and two trailer sizes. This is not a pitching or flipping approach. Long casts are an essential part of the application, as far away from the boat as possible. Retrieve through isolated clumps of grass, usually within one foot of the surface. You'll get to see lots of your strikes, and it's especially exciting to see the bulging wakes of fish that are zeroing in on the swimming jig from 5-10- feet away in the grass! Grass often signifies clearer water than the surrounding area. Now clear water is a relative term to Jimmy who defines it to mean water with somewhat better visibility than anything else around your surroundings. For example, if you have an inch of water visibility within the main river, but in a backwater or oxbow area you have one foot of visibility, that is relatively clear water to Jimmy who feels bass may be able to adapt their eyesight to become accustomed to seeing well even in stained water. I would definitely not use it in muddy water presentations, but for stained water that is not darkening in color, fish indicate they can see the swimming jig quite well because you'll spot them coming at it from great distances once they sight it. And it is mainly a sight presentation. Jimmy believes that there's not a lot of noise or vibration that you are accustomed to with other types of search baits or reaction baits. A crankbait, topwater, spinnerbait, buzzbait...a school of bass can get shy about hitting any of these lures after you make 3-4 casts through the school. Even hooks rattling against the belly of a crankbait make noise that fish notice - and may shy from after a couple of casts. They may attract positive attention to start, but repeated casts can turn schools off. A swimming jig does not. If bass are going to go for a reaction bait of any kind, I can usually call them up on the swimming jig, says Jimmy, and I can usually catch more bass out of a school on a swimming jig than with any other types of reaction baits. The swimming jig doesn't seem to spook school fish. You can catch multiple fish out of an area. 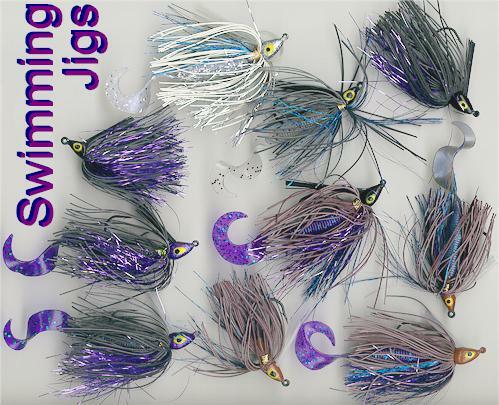 Jimmy hand-ties his jig skirts with flat body color, using living rubber in dull matte finishes of either black or brown tied over the top of various colors of tinsel. I generally use 30-32 strands of rubber says Jimmy, which is sparser than usual. I rarely use silicone skirt material since it seems to react slower and stiffer than living rubber. The square-cut strands of living rubber have a pulsating effect that serves to breaks up the silhouette of man-made materials. Suddenly, it's not simply rubber and tinsel anymore to the fisherman or to the fish. As the rubber wriggles and pulsates, it is constantly changing the look of the tinsel the fish sees flashing underneath the wriggling rubber, which gives a non-stop glittering illusion of life to the swimming jig. I concentrate on the underlying tinsel to mimic scales, add flash and provide specific seasonal coloration. By that I mean I keep the rubber constant (black or brown), but use the tinsel to add highlights of colors of specific baitfish I am trying to imitate, or specific colors baitfish take on at certain times of the year. Most of the time, I am definitely copying a juvenile bluegill, which I try to mimic by getting the color down to a bluegill pattern of sorts, which may vary with the season. Bluegill are the main baitfish forage for the spawning season and into summer until shad start coming into the creeks to spawn, and the young-of-year shad become big enough for bass to begin targeting them in fall. So, I'd say some people may do this in the fall with white jigs keying on shad. However, I do this keying on bluegill, and I definitely do my best with swimming jigs by imitating bluegills from pre-spawn through post-spawn. I also use it in summer when I require a quiet presentation to search out and find schools of bass, as described above. Bluegill mimic. Awesome in gin clear water. Right during the spawn, brown/blue works better with spawning bass. In closing, this is a different presentation that no one else does. It is a way to cover water fast. It's not the crawling, hopping, bottom-bumping approach taken with jigs. Quite the opposite as the swimming jig is kept moving in the top of the water column. Most good tournament waters these days are heavily pressured. When you have a bunch of guys in a pressure situation, you just know that nobody else has been swimming this jig over the fish the way you can use it instead of throwing a spinnerbait or power bait or some type of searching lure for schools of bass...or for spawning bass that are defending their beds from marauding bluegill...or for post-spawn bass that are marauding bluegill beds themselves. As we've said, Tom Monsoor must get the credit, and a lot of Mississippi River guys across Wisconsin, Minnesota and Iowa are trying to get their hands on these jigs. However, it's not only a river fishing application. It also applies to lakes, ponds or anywhere there are weeds, bass and relatively clear water. It's not just an Upper Mississippi tactic either, as Tom Monsoor has used swimming jigs in major tournaments with equally-good response from bass in places like New York, Florida, Tennessee, and Alabama, says Dave Snyder. And Jimmy Johnson used them to fish the 2002 Bass Masters Classic on the New Orleans Louisiana Delta. Want Even More Grub Fishing Know-How? 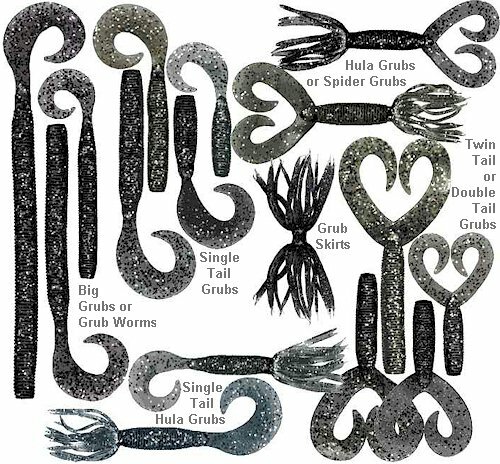 All grubs shown from Gary Yamamoto Custom Baits.